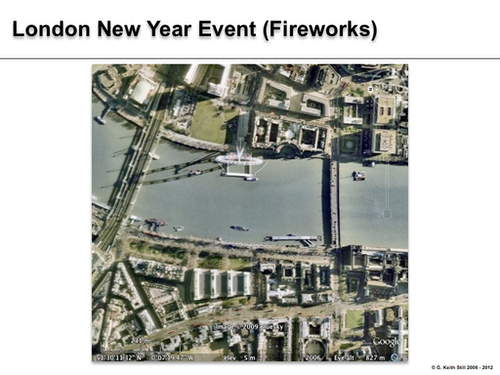 I ran a series of�workshops�(UK�Cabinet Office Emergency Planning College),�for the�Police�and Emergency Planners associated with the London New Year Event. Following these I was engaged to model the New Year Event 2006/7. 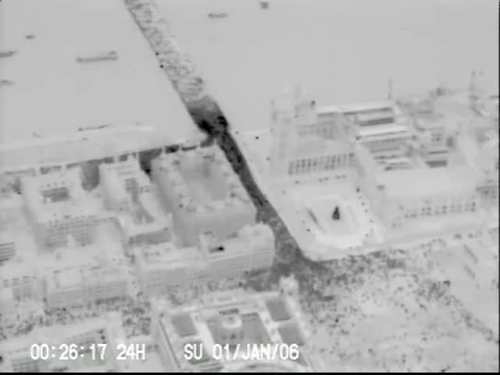 The system - shown below - is a fill predictor designed and deployed for London New Year Events (LYNE). 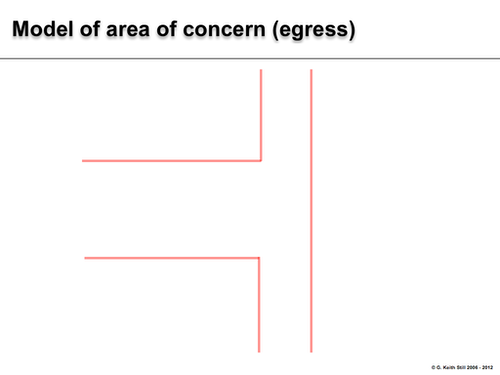 �Since then I've run workshops for various elements of the site, planning and operations. 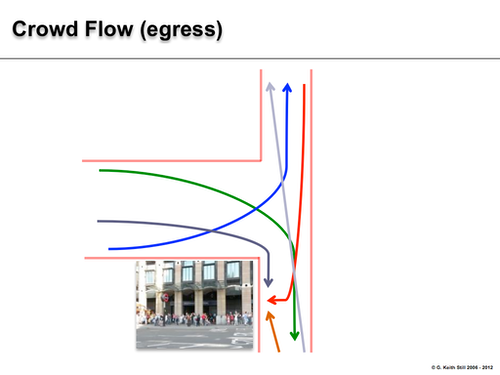 Left - the old modelling environment (Myriad II) �where the user could create a network of the site and can experiment with filling the viewing areas�for the London site. 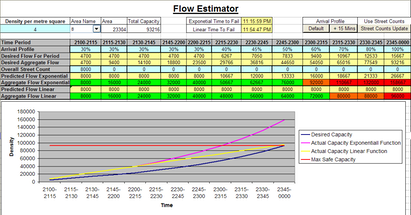 From the network�analysis we can address key�questions such as flow rates and fill times. 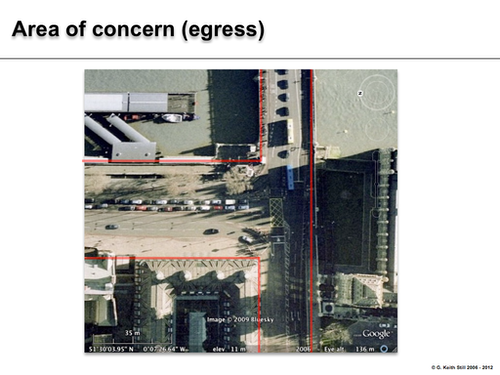 Also from�these type of models we can determine a suitable crowd monitoring system. 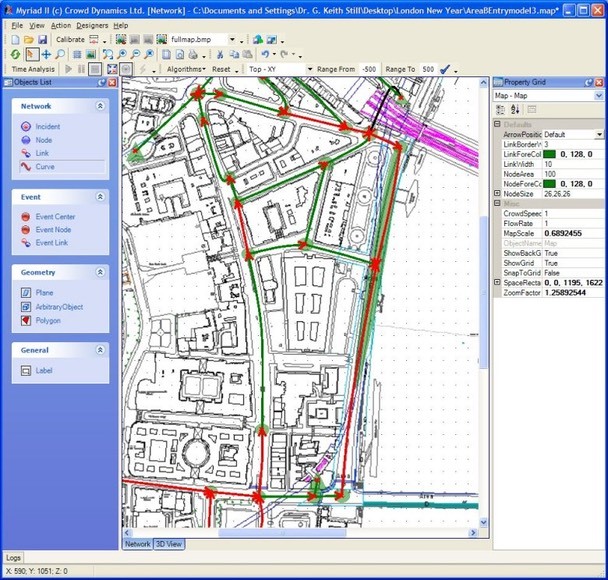 We designed, developed and deployed a fill predictor (based on the modelling/analysis) to provide an�estimate of how quickly the space was filling in real-time. �Over the last 7 years we have run workshops on the�information and management of crowds for this specific event. The system was designed to count from empty. In recent years the event spaces have been filling earlier and the arrival profile has significantly changed. The team who now operate the system should update the core algorithms accordingly. 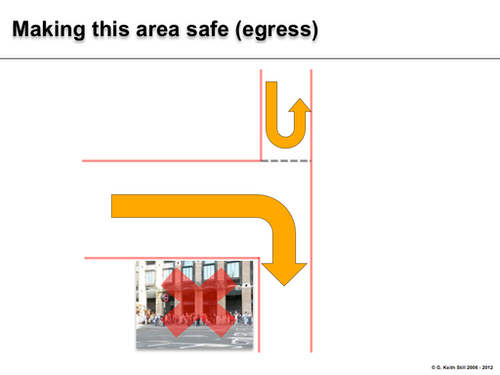 Where these lines cross, at high crowd density, we have high risk of congested trips, slips and falls. These are the key questions we can address in the simplified model. Bad Weather hampers New Year celebrations.